have advances in of The last few seen our understanding revolutionary years heterostructures. An amount the electronic of enormous properties quantum undertaken both the and the theoretical of research has been on experimental in nanostructures. The field vast of electronic now covers a aspects transport and extensive number of review of an books, articles, spectrum topics, papers and conference continue to be in this area. published Complete proceedings of this and field is the of this book. beyond exciting evolving scope coverage We refer the interested reader to of the excellent and some comprehensive books and conference on this proceedings subject. Much has been made in our of confined understanding quantum progress A's is well it is to construct heterostruc known, possible quantum systems. tures which well as one dimensional are approximated quasi two dimensional, zero dimensional Our interest here is in the of or properties particles systems. We brief andfields in two dimensional a intro quasi (2 D) systems. provide duction to the of 2 D in to motion in 2 D systems, particular systems physics the confined within finite For we will assume that a area. simplicity, generally Such confined is defined an infinite hard wall a by potential. system boundary We will 2 D will be referred to as a or as a wire. This monograph is accessible to anyone with an undergraduate background in quantum mechanics, electromagnetism and some solid state physics. 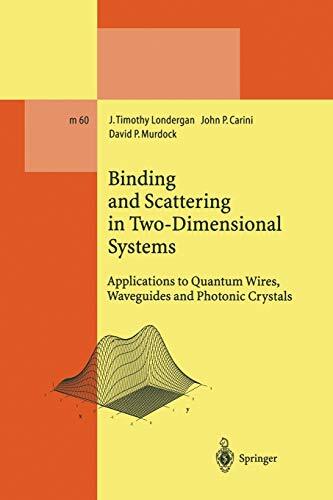 It describes in detail the properties of particles and fields in quasi-two-dimensional systems used to approximate realistic quantum heterostructures. Here the authors treat wires, i.e. they assume an infinite hard-wall potential for the system. They discuss bound states, the properties of transmission and reflection, conductance, etc. It is shown that the simple models developed in this book in detail are capable of understanding even complex physical phenomena. The methods are applied to optical states in photonic crystals, and similarities and differences between those and electronic states in quantum heterostructures and electromagnetic fields in waveguides are discussed.